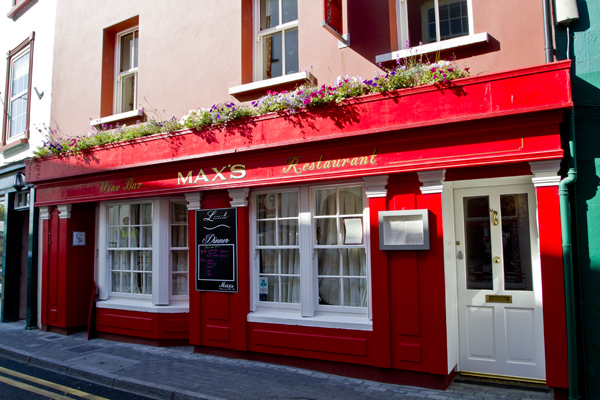 Max's restaurant in Kinsale. Photo by David Lansing. Damn me if I can understand how it is that Mr. Lynch and I keep getting lost in a town so small that a fire in the hearth of a house on one end of town can be used to make tea in a house on the other end. This and Mr. Lynch keeps telling me he knows Kinsale. Been here before, says he, leading me up a hill over the harbor, neighbors sitting on their stoops smoking a fag or just enjoying the fine evening. Another five minutes and we’ll be at Old Head, I tell him. Hard headed Mr. Lynch refuses to acknowledge he’s lost so it’s up to me to ask the old gent suspiciously watching us meander in circles how to get to Max’s restaurant. Down them stoney steps, says the old gent. Pass that house there. I thought you knew this town? I do, says Mr. Lynch. But it’s confusing. Built in a circle. Besides, I’m left handed. Can never understand how being left handed accounts for no sense of direction. Down the stoney steps and sure enough, there’s the wine red Max’s, blackboard in front with pink chalk putting up the “Catchs”: lobster, john dory, hake, ling cod, salmon. Gawd I’m hungry. Busy inside. Only table left is the one by the fireplace reserved for us. Have you any oysters? I ask the waitress. We do, says she. Local. Give us a dozen then while we look at the menu. And a bottle of the Entre Deux Mers. A very unpretentious wine, I say to Mr. Lynch, but grand with oysters. For the main I get the ling cod and Mr. Lynch orders their special seafood soup with mussels and scallops and big chunks of white fish in a light broth. Lovely. Cheese plate and port to finish. Older couple, all dressed up, sitting next to us. They’ve been listening to our conversation. About how the menu here lists who and what caught all the food. It’s John O’Brien, license no. C362, who brought in the lobsters and crab today, and Jamie O’Dwyer, who produced the oysters, mussels, and scallops. We’ve Matt O’Connell to thank for the ling cod and Quayford Company on Market Street for the fine creamy Cashel blue cheese. I’ve been lusting over your Cashel, says the dark-haired woman in a red dress at the next table over. Can never get that back home. Boston, she says. Though I was born in Ireland. Near Killarney. Left when I was three. The husband and I are celebrating our 27th anniversary, she says, holding up a glass of red wine in front of her face. Her silent husband, raises his own glass and dips it towards us. Congratulations, says Mr. Lynch. That’s a fine accomplishment, 27 years. Gawd yes, says the woman, who appears to be half-tight. She turns her chair towards us and tells us how she and her husband come back to Ireland almost every year. Big family reunion here this year, but they decided to go off on their own before the family arrives to celebrate their anniversary. Everyone says, why would you go to Kinsale for an anniversary? It’s charming, isn’t it? Just about to ask for the bill when another, younger couple, sitting on the other side of the room, comes over and tells all of us that they’re also here celebrating their anniversary. Our ninth, says the doughy boy. We live in Oysterhaven. Just down the road. With three little ones, it’s not easy to get out for an evening. Well that’s something, says the older woman. Let’s get a glass of wine and toast to that. To anniversaries. There’s only a touch of red wine left in the bottle so her husband quickly calls over the waitress and orders another. Insists on giving Mr. Lynch and I a glass as well. Fine Bordeaux. Much nicer than my Deux Mers. Probably expensive. Much toasting and long stories. Everyone in the restaurant except the six of us have left. Our waitress, her head resting on her folded arms, sits at the bar, waiting. We pay but the two other couples seem in no hurry to finish the evening. They’re ordering up another bottle of wine as we shake everyone’s hand and congratulate them once again. Fine evening. Now if we can just find our way in the dark back to our hotel without getting lost. Not to be picky, but it was the second couple’s 10th anniversary. Who celebrates a 9th? One may enjoy Beethoven’s Ninth, have a good front or back nine in golf, but a ninth wedding anniversary – who does that? Why do people always say “Not to be picky” when they’re being picky? Kinsale does indeed look charming. I’ve loved seeiing the colors of the buildings in your posts. I feel like taking a paint brush to the front of our house and paint it the Max’s red. I think the neighbors might be picky about that, though. I thought using the other option, ‘with all due respect’ would be pushing it given our temperaments.